This hand made leather 5 x 7 inch journal has a leather cord closure is set with a moonstone within a Triple Moon design. 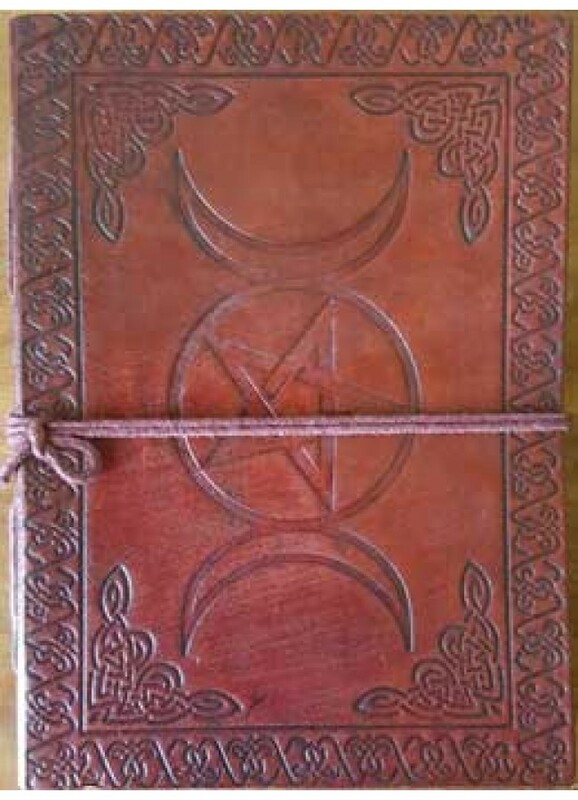 This Triple Moon blank leather journal is embossed with a Pentacle inside it's center full moon, encircled by leather woven stitching, with the embossed crescent moons on top and bottom. It's bordered with Celtic tooled edging .The back cover is adorned with a floral pattern. It's spine edge has attractive leather cross stitching and the journal is secured by an attached cord for it's closure. There are 200 blank hand made pages ready to be your Book of Shadows, a journal, dream diary, spell book, sketch book and more. Please expect some variation in size, color or design from photo example as each is hand made and unique. Item Number: AA-BBBCTMP | Approximate Size (Inches): 5.00 wide x 1.00 deep x 7.00 high | Approximate Shipping Weight: 1.00 lbs.